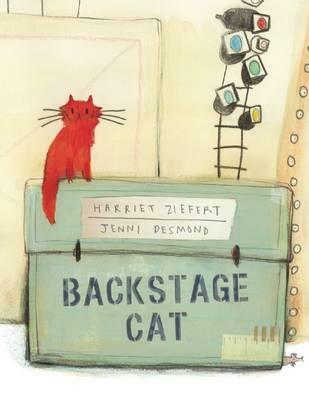 Simon is a backstage cat, feted and adored by her superstar theatre actress. But one evening, as his mistress goes on stage, the cat decides to nip out the stage door. A loud bang gives Simon the fright of his life and--zoom!--he's soon up a tree where an entire army of theatre personal attempt to lure him down. Yelling, calling, sheer frustration--nothing works--until the cat's mistress comes out and sings a sweetly soft tune that lures her fluffy friend down. This is a sweetly simple story about the importance of friendship and sticking together. Gorgeously naive imagery, by the wonderful Jenni Desmond, lends this story a wistful look that will enchant both kids and adults. Absolutely bananas for her colour palette, too. Kids are sure to fall in love with Simon.